As the horrific images of the Dimapur mob lynching incident started appearing in my social networks, my mind raced to find parallels of this event. Had I seen something like this before? Not really! It does not mean that they never happened but they did not happen so close to my home and in the full glare of media. These were not brainwashed ISIS or Taliban fanatics but college students clicking their selfies with a grotesque corpse of a man they just killed. There was no remorse or horror in their faces. They were just enjoying what they were seeing. Now, there are many disturbing implications to this and all these angles are being discussed threadbare in the media. So, I do not want to make any redundant points but just want to talk about a certain film today. 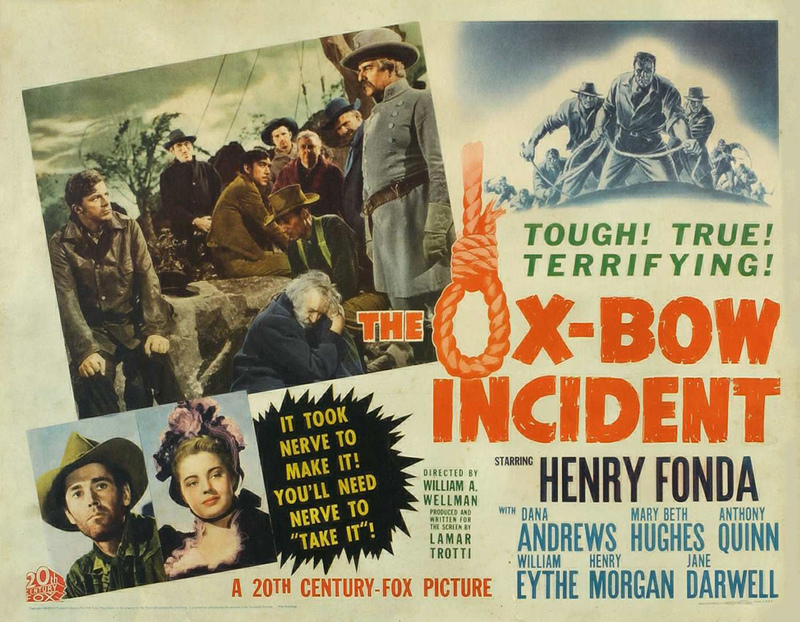 William A. Wellman’s The Ox-Bow Incident (1943), based on a novel of same name, was probably one of the earliest revisionist westerns that immediately came to my mind when I first heard of the incident in Dimapur. So, I decided to watch it again. So, what exactly happens in the film? Well, to cut a long story short, two drifters in the Wild West played by the iconic Henry Fonda and Harry Morgan arrive at a dusty town somewhere in Nevada, way back in 1885. The town is already in a grim situation due to cattle raiding incidents. Locals are agitated and they need to catch the culprits. Just at that point the news comes that a local rancher has been murdered who are likely to be the cattle raiders themselves. It does not take much time for a mob to gather and they form a party to search the culprits. Our drifters also join the party (probably to avoid being suspected). We never know what their motives are, this just go with the flow. After some time, they catch a band of people, including a well-educated young man, a Mexican and an old man. The kangaroo court ensues although a few saner people urge the mob to have patience and wait for proper evidence. Very soon, it becomes obvious that they have already decided who the culprit is and the decision is purely based on the fact that none of the suspects were familiar to them. What happens after that can easily be guessed! It is grim and morose. Unlike typical westerns, it has no entertaining elements. There is no real action adventure or rousing music. There is machismo but not of heroic kind but of the most cringe worthy (and realistic) type. The film exactly shows the futility of mob violence. 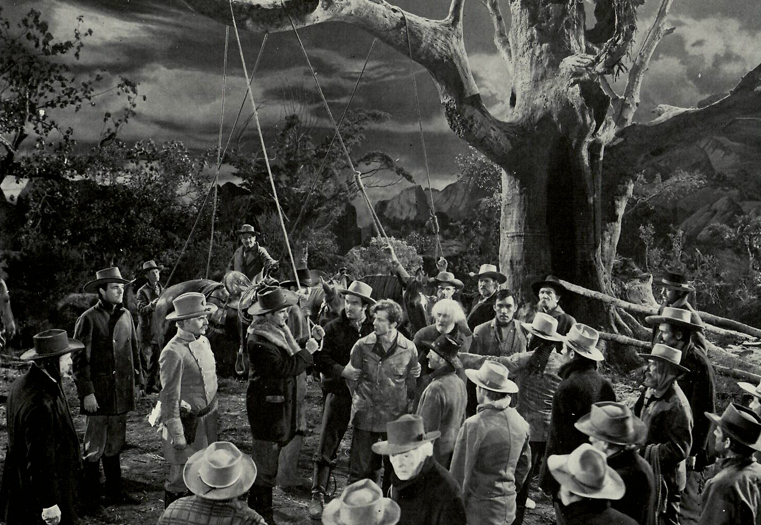 It was as artsy and pensive a western could get, especially in 1943 where indies or experimental cinema were unheard of and even the term neo-realism was yet to be conceived. This is exactly why I see a faint glimmer of hope at the end of watching this film. It is our ability to introspect as human beings. I’m not saying that everyone can but at least there is always someone who can see through the madness and restore sanity. Although this is a work of fiction, it must have been based on genuine events. After all, the so called “west” was notorious for lawlessness and violence. So, to think that way back in the 1940s people made such a damming film shaming their own society is heartening. After the initial hours of insanity, I’m also seeing that people are finally realizing what they have done in Dimapur. Of course still some people are fighting over the identity of the culprit and authenticity of the case. But that is not even the point. What we have to realize is that as human beings we must rise above such behaviour because the damage is irreversible. He may well have been the culprit but what if he was not? How many people will now be able to live with that guilt? That is where The Ox-Bow Incident offers me a glimmer of hope, although a faint one. It shows the ability of human beings to feel guilt and introspect. Only if those college kids in Dimapur had seen this! We need to make this world a better place ourselves. We need to Look Up rather than look down upon others. Optimism is a quintessential human quality and even at the darkest of hours, we should just remember these finer achievements of our civilization. Having graduated in the field of political science, and grappled in the theoretical assimilations of political philosophy, I've gained an insight into the workings of of public policy initiatives, with organizational experience. Occasionally, but however, the effort shall be to create art and then let it recede into debris of human failure. My experiments and adventures, with truth.